Pepco Holdings was a holding company incorporated in February 2001 for the purpose of affecting the acquisition of Conectiv Power Delivery by Potomac Electric Power Company (better known as "Pepco"). The acquisition was completed on August 1, 2002 at which time Pepco and Conectiv became wholly owned subsidiaries of PHI. Conectiv itself had been formed in 1998 to be the holding company of Delmarva Power & Light Company (DPL, better known as "Delmarva Power") and Atlantic City Electric Company (ACE) in connection with the combination of DPL and ACE. In 2005, PHI resumed the use of the Delmarva Power and ACE brands for purposes of operations, with the result that Conectiv Energy was the only remaining Conectiv brand and was restricted for PHI's energy production facilities. 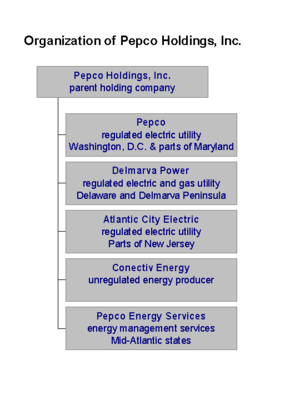 Operations of the various companies controlled by Pepco Holdings take place in the Mid-Atlantic states of the United States. Pepco serves Washington, D.C. and its Maryland suburbs, Delmarva Power serves the Delaware and Maryland portions of the Delmarva Peninsula, and Atlantic City Electric serves South Jersey. In 2008, Delmarva Power sold its service area in the Virginia portion of the peninsula to A&N Electric Cooperative and Old Dominion Electric Cooperative for $44 million. In April 2010, Conectiv Energy was sold to Calpine Corporation. Exelon announced the proposed purchase of Pepco Holdings, Inc on April 30, 2014. The merger was rejected by the District of Columbia Public Service Commission in August 2015, though it was approved by other federal and state regulators. On March 23, 2016, the merger with Exelon was approved by the District of Columbia Public Service Commission, under a revised set of terms. The merger was completed on that same day. In December 2011, the non-partisan organization Public Campaign criticized Pepco Holdings for spending $3.76 million on lobbying and not paying any taxes during 2008-2010, instead getting $508 million in tax rebates, despite making a profit of $882 million and increasing executive pay by 118% to $9.7 million in 2010 for the top 5 executives. In 2006, Pepco Holdings restated its previously reported consolidated financial statements for the three and six months ended June 30, 2005, to correct the accounting for certain deferred compensation arrangements. ↑ "Introduction to Pepco Holdings, Inc. (PHI)". Pepco Holdings. Retrieved April 21, 2012. ↑ "Delmarva Power Completes Sale of Virginia Operations". Pepco Holdings. January 2, 2008. Retrieved May 3, 2012. 1 2 Aaron Nathans (6 May 2011). "Pepco reports profit of $64M in first 3 months". The News Journal. Wilmington, Delaware: Gannett. DelawareOnline. Archived from the original on 7 May 2011. Retrieved 7 May 2011. ↑ Anu Passary (March 25, 2016). "Exelon Closes $6.8 Billion Merger With Pepco Following Thumbs Up From Regulators". Tech Times. Retrieved June 28, 2016. ↑ Portero, Ashley. "30 Major U.S. Corporations Paid More to Lobby Congress Than Income Taxes, 2008-2010". International Business Times. Archived from the original on 26 December 2011. Retrieved 26 December 2011. ↑ "SECURITIES AND EXCHANGE COMMISSION Washington, D.C. 20549 FORM 10-Q".